The Santa Barbara County Office of Arts and Culture hosted a free public site-specific video installation designed for the classical arches and front edifice of the County Courthouse for Earth Day 2018. At the center of the city of Santa Barbara, where Poseidon and Aphrodite are embedded in stone, Entangled Waters visually referenced Michelangelo's The Flood panel in the Sistine Chapel. As lands and their stories wash away and oceans fill with plastic, oil spills and chemicals, the installation evokes a tangled web of humanity, sea life and pollutants. With environmental steward Lamara Heartwell as executive producer, Entangled Waters features the concepts and choreography of director Robin Bisio. Installation artist Ethan Turpin is the project’s producer as well as cinematographer and editor. 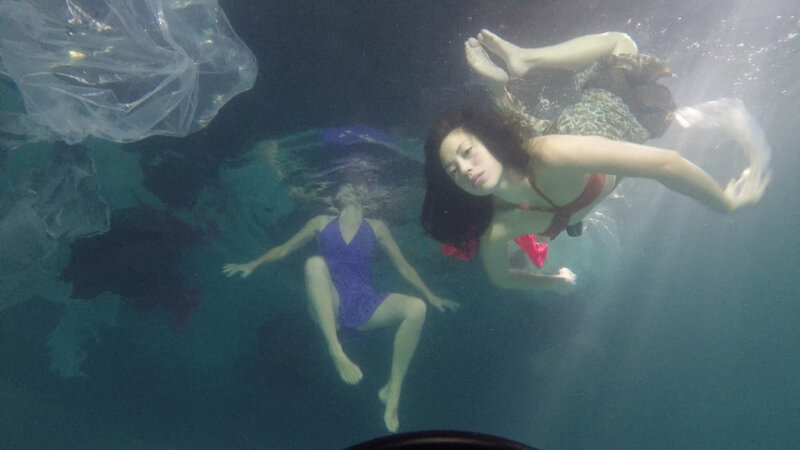 Underwater performances are by dancers Heartwell, Turpin, Kaita Mrazek, Erick Alvarez and Kweisi Petillo. Costume design is by Anaya Cullen, lighting and camera support by Carter Sisney with installation assistance by The Environment Makers. The immersive underwater installation was accompanied by a live score for bass, saw and voice by Jim Connolly. This installation is site-specific but the creative team is producing video installations around Southern California. Contact Robin Bisio to learn more.